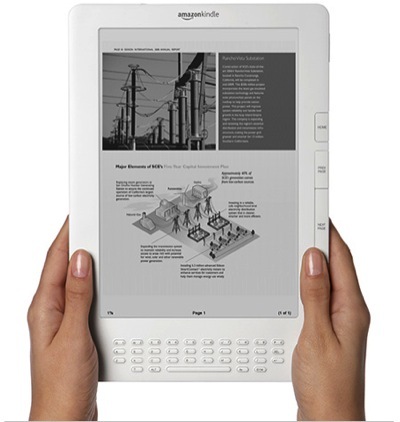 At various universities and colleges, students have spent the last year participating in pilot tests by Amazon on using the Kindle DX in the college environment. By doing real world testing, Amazon was hoping to gather customer use information that would confirm the DX as a key learning tool, and feedback on how it can be improved upon in the future. The Seattle Times reports that the response was not exactly what Amazon might have expected. The results of the various programs going on across the country agree that the Kindle is a wonderful reading device, but that there are shortcomings when it comes to student use. In the Seattle Times article and a report published by Princeton on their pilot program students are missing that tactile feel and ability to annotate or highlight easily. There is also the factor of how a textbook is read versus a novel. As one student points out in the Times article, textbooks are used mainly in a non-linear manner, involving lots of skipping around and flipping of pages, and the Kindle could not keep up in an efficient manner. Additionally, students reported that the lack of color made charts and illustrations in the texts harder to understand. That is to say that there were no positives from the various programs, Princeton’s report showed that using Kindles in classrooms did reduce paper use significantly, by 50%+ in the classes taking part in the pilot. Of course, this does not mean the end of the various efforts of companies to get their particular ebook reader to become the choice of students and learning institutions, as the Times reports, the higher-ed book market is around $4 billion. Apple is currently planning to run tests with the iPad at various locations next year, and there is some thought that it might fare better because of it’s color screen, better web browser, and application support. At the same time, Amazon will be able to take the information gathered from the pilot program and incorporate it into their next generation reader and hopefully end with a product students find more attractive. What do you think? Are ebook readers a good idea for use in the classroom? Can Apple’s iPad succeed where Amazon’s Kindle has apparently hit an obstacle? Will the iPad be better for educational use than the Kindle? What can Amazon do to improve the Kindle for students?